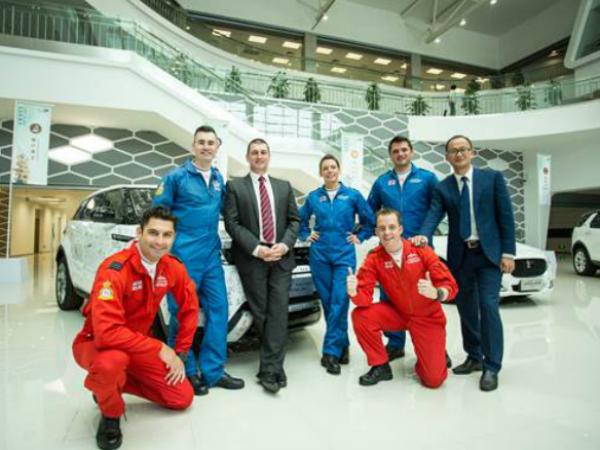 On 6th November, the Red Arrows Aerobatic Team of British RAF was invited to visit the Chery Jaguar Land Rover production base in Changshu to experience the excellence of its global uniform manufacturing and leading concept of corporate culture. The official name of the Red Arrows is Royal Air Force Aerobatic Team (RAFAT), which is the symbol of speed, agility and precision by RAF. Since its establishment in 1965, Red Arrows has completed more than 4,800 performances and repeatedly performed major missions of international aviation, thus becoming the pride of the RAF and even the entire UK. In the 2016 China International Aviation and Aerospace Exhibition (Zhuhai), Red Arrows paid its first visit to China, and its fantastic performance left a deep impression on domestic aviation fans. During this period, Jaguar Land Rover provided a fleet support as a long-term partner of Red Arrows. Having been invited by Chery Jaguar Land Rover, the Red Arrows came to China again and visited the Changshu Plant this time. In the Cultural Lecture Hall, Red Arrows had in-depth exchanges of ideas and shared experience with the staff of Chery Jaguar Land Rover. Red Arrows pursuit of speed, precision and teamwork and the practice of Chery Jaguar Land Rover in efficiency, quality and collaboration are all their cultural collisions and benefits for the two top teams from different industries. Red Arrows and its party also visited Changshu production base accompanied by the leadership team, having an in-depth experience of Chery Jaguar Land Rover’s quality manufacturing system under a global uniform standard. At the end of the visit, Red Arrows team members witnessed the upcoming new Jaguar XEL in the T&F Shop. With advanced production process and stunning appearance, Jaguar XEL won unanimous praise from the Red Arrows team members alike, and attracted the first batch of fans before the market. The success of Red Arrows stems from its ultimate pursuit of speed, agility and precision, while Jaguar Land Rover is also the practitioner of ultimate performance and quality. As a representative of the British automotive industry, Jaguar Land Rover continues to apply cutting-edge aviation technology to automobile manufacturing and goes on to enhance automobile performance. Chery Jaguar Land Rover introduced the most advanced aviation-class self-piercing riveting technology of Jaguar, and used it in the smart aluminium body structure, perfectly interpreting the speed, agility and precision of land-driving. On the 50th anniversary of the establishment of Red Arrows, Prince Charles attended the celebration on behalf of the British royal family. Like the Red Arrows aerobatic team, Jaguar Land Rover is equally favoured by the British royal family. Today, Chery Jaguar Land Rover will bring a pure British lineage into China, thus bringing each user a respected driving experience.